I’m so thrilled to show off the cover art of the La Fortuna by my friend and amazing cousin, Lorraine Gonda. She is doing the illustrations for the third installment of Phillip’s Quest, which will be coming out this November. Eleven pirates. mermaids, and a city under the Sea. The most exciting leg of the adventure that Phillip, Edward, and Ava Dreamspinner have seen yet. 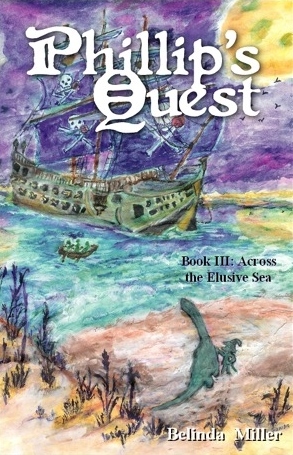 Phillip’s Quest Book III: Across the Elusive Sea won’t be out until November – but you can read a sneak peek right here on my website! The La Fortuna, a large three masted galleon, sailed from the tranquil, secluded cove of the Carnelian Sea. 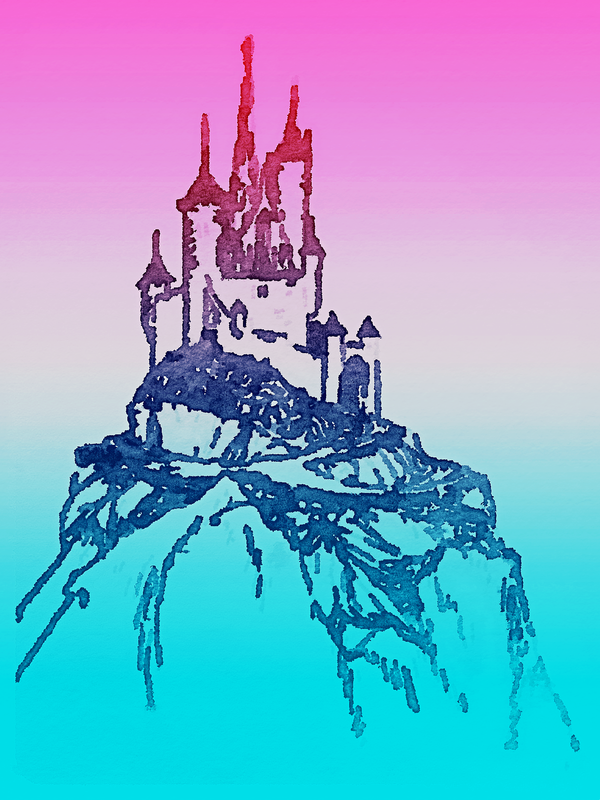 She headed north, towards Winterfrost Castle. The sea, despite its name, glowed a deep blue-green, as it reflected the moon beams cast by Winterfrost’s moons. The water was calm and the La Fortuna danced along its gentle waves performing a graceful ballet. It was barely touching the water. The breeze was chilly but, not cold. The billowing sails were enjoying the steadiness of the gentle wind. For the first time since he left Twistedoak, Phillip could see the many constellations in the skye above him, as he leaned against the ship’s rails. It was the first time, in many days, he had thought about his dearest Ivy. A pang of guilt settled in his stomach for not thinking about her more. How long had it been? He looked down and saw the orange patch she had sewn to repair a hole, hanging from a thread, but still attached to his britches. Phillip patted the patch as if it were a puppy but, it was only a worn, dirty patch, covering a little hole in his britches. It was the last thing he had of Ivy. Phillip had hoped that he would see Aquarius, a sign that Azur was near. Instead, the stars in that constellation did not appear. Malach was a regal figure, even for a pirate. A handsome elf, tall and lean and dressed beautifully in his silks of green and blue. His silvery hair was tied back in a braid and his violette eyes shone like emeralds. Although his skin was tanned from spending too much time on the sea, it looked like pale gold. His mannerisms and voice were gentle and calm. Yet, he was a pirate and Phillip could not wait to hear why. Phillip acknowledged the Captain with a nod and went below to be with Ava. He heard her whimpering in her sleep. The brontosaurus had a heart as big as her size. How quickly she and Edward formed a bond, two very unlikely friends. When Edward had been carried off by the Red Witch’s chiroptera bat, Bael, Ava almost fell apart. She was grief stricken. Phillip took one of the blankets from Ava’s saddlebags and wrapped himself in it. He patted Ava on her head and whispered to her softly. He regretted making that promise to her, as soon as he said it. What If they couldn’t find Edward? He had never broken a promise. Then he thought of Ivy. He had made a promise to her and had broken it. He could not keep her safe. Phillip would not break that promise again. To find out whether Phillip and Ava Dreamspinner rescue Edward with the help of Malach the Elf Pirate and his friends, sign up for the Gnome Gnews-Letter so that you’ll be the first to know when Phillip’s Quest Book III: Across The Elusive Sea is released this November!